SoundRoots World Music & Global Culture: Daily Spin: Would you pay $8 for a watermelon? Daily Spin: Would you pay $8 for a watermelon? Sometimes global fusion albums just feel like they're trying too hard. On the other end of the scale is the group Therianthrope. Yeah I know their name is a mouthful, but their instrumental tunes will melt in your ears. The core duo of Dusty Brough (nylon guitar) and Miles Shrewsbery (tabla/percussion) are clearly drift-compatible, creating intricate songs filled with notes from their talented fingertips, but never overcrowded. Their chops are serious; their song names are less so: "Centaur Shakedown," "Wolfman Vs. You," "Canary in a Bitcoin Mine," "Unicorn Tranquilizer." 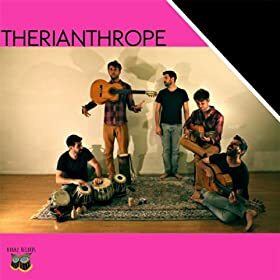 Their promo materials suggest the genre "Indian surf music," but to my ears they're just a couple of amazing musicians (plus friends on a few tracks) who make amazing music together.